On the 4th of July Earth will be at its greatest distance from the Sun -- an annual event called "aphelion." July 3, 2001 On the 4th of July Earth will be at its greatest distance from the Sun this year. But don't expect any sudden relief from the heat, say scientists. Northern summer will continue unabated --perhaps even worse than usual-- despite our arrival at a distant part of Earth's orbit called "aphelion." "Like all planets in our solar system, Earth travels around the Sun in an elliptical orbit," explains astronomy professor George Lebo, a Summer Faculty Fellow at the NASA Marshall Space Flight Center. "We make our closest approach to the Sun (147.5 million km) in January, that's called perihelion, and we're farthest from the Sun (152.6 million km) in July, that's aphelion. This year, aphelion falls on Independence Day in the USA." 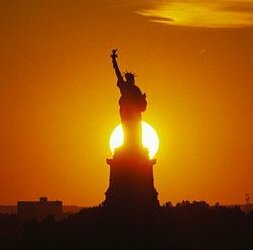 Above: The sun setting behind the Statue of Liberty is a little more distant than usual on the 4th of July. Image Credit and copyright: Corbis.com, all rights reserved. The eccentricity of our planet's orbit is mild; aphelion and perihelion differ from the mean Sun-Earth distance by less than 2%. In fact, if you drew Earth's orbit on a sheet of paper it would be difficult to distinguish from a perfect circle. "Seasonal weather patterns are shaped primarily by the 23.5 degree tilt of our planet's spin axis, not by the mild eccentricity of Earth's orbit," notes Lebo. "During northern summer the north pole is tilted toward the Sun. Days are long and the Sun is shining more nearly straight down -- that's what makes July so warm." Editor's Note: Do you have trouble remembering the difference between perihelion and aphelion? An old astronomer's trick is to recall that the words "away" and "aphelion" both begin with the letter "A". Does aphelion bring any relief from northern heat? Yes and no, answers Roy Spencer of the Global Hydrology and Climate Center in Huntsville, Alabama. "Averaged over the globe, sunlight falling on Earth in July (aphelion) is indeed about 7% less intense than it is in January (perihelion)." That's the good news. The bad news is it's still hot. "In fact," says Spencer, "the average temperature of Earth at aphelion is about 4o F (2.3o C) higher than it is at perihelion." Earth is actually warmer when we're farther from the Sun! How can that be? It's because our planet is --in a sense-- lopsided. 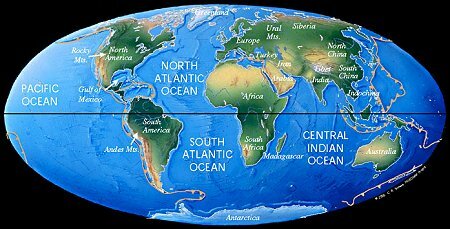 Continents and oceans aren't distributed evenly around the globe. There's more land in the northern hemisphere and more water in the south. During the month of July --near the start of northern summer-- the land-crowded northern half of our planet is tilted toward the Sun. "Earth's temperature (averaged over the entire globe) is slightly higher in July because the Sun is shining down on all that land, which heats up rather easily," says Spencer. Solar heating raises the temperature of continents more than water because the heat capacity of land is lower. Bill Patzert, an oceanographer at NASA's Jet Propulsion Laboratory explains: "The temperature of land changes easily, which is what we mean by low heat capacity. Consider the desert: At night the desert is cold, perhaps only 60o F (16o C). When the Sun rises in the morning the temperature might jump to 100o F (38o C) or more." Such mercurial behavior is characteristic of materials like rocks and soil with little thermal inertia. It doesn't take much sunlight to substantially elevate their temperature. "On the other hand," says Patzert, "oceans have a tremendous heat capacity. They tend to keep [the energy] they capture and are very stingy about giving it back." This quality moderates the temperature swings of ocean environments. "Let's say you went sailing off Malibu Beach at noon," says Patzert. "The offshore temperature might be 75o F (24o C) -- pretty pleasant!" What happens after sunset? "The temperature drops, but only a few degrees because the thermal inertia of the ocean is so high." All this explains why July is our planet's warmest month: Northern continents baked by the aphelion Sun elevate the average temperature of the entire globe. Six months later, in January, the situation is reversed as our planet presents its water-dominated hemisphere to the Sun. "We're closer to the Sun in January," says Spencer, "but the extra sunlight gets spread throughout the oceans." Southern summer in January (perihelion) is therefore cooler than northern summer in July (aphelion). Strange but true! If you're feeling baked on the 4th of July holiday and wish that aphelion brought more relief, there is something you can do: Take a hint from the watery southern hemisphere. Locate the nearest swimming pool and sample first hand the benefits of water's high heat capacity. A little physics can be refreshing after all! Kepler's Laws of Planetary Motion - find out more about how planets move around our star.